You aspire to build a great practice your way, helping your clients fulfill their dreams as you fulfill your own. 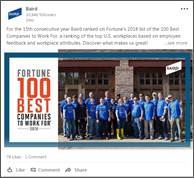 More and more great advisors are coming to believe that’s done best through an independent, employee-owned, client-focused firm – a firm like Baird. Everything we do here aims to help you provide the best financial guidance and service in a way that builds and sustains strong client relationships. We provide an environment that supports your entrepreneurial spirit, offers flexibility in business models and delivers world-class capabilities. Because we are employee-owned, we all have a vested interest in your success and the success of your clients. Imagine the power of you and Baird. Providing comprehensive Wealth Management in a consistent, client-first approach is one of the key differentiators for Baird financial advisors. Our Wealth Solutions Group provides the research, insight and expertise to help you meet the needs of your clients – from college funding to mitigating risk and meeting retirement goals – their support help create long-lasting, meaningful client relationships. Meet the team. When you’re ready to make the move, we’re right there with you in person to make sure the transition to Baird is as easy and seamless as possible, both for you and your clients. Learn more about the transition experience from advisors like you. The Marketing team serves as a partner throughout your transition and beyond. Whether you are planning a client event, looking for content to share with clients or building your social strategy, as an extension of your team, Marketing will help build your brand and provide expert business development guidance. A customizable website is an extension of your practice and lets you communicate your differentiator to clients and prospects. Serves as a hub for clients to access their accounts and for you to share education. An active presence on social media enables you to connect with your network and present yourself as an expert. The ability to share custom content lets your voice come through and helps you strengthen your connections. Customizable brochures let you make a lasting impression with prospects. Turnkey greeting cards make it easy to reach out to your clients. Marketing can also help you create an eye catching invite for your upcoming client event and will share best practices to ensure your event is a success. 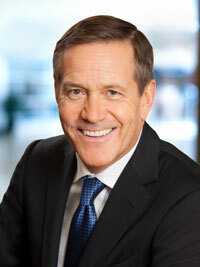 John Taft Joins Baird as Vice Chairman. Baird posts record net revenues for eighth consecutive year. Baird Chairman Paul Purcell and Chief Human Resources Officer Leslie Dixon were featured in a March, 2018 WorkSpan magazine article titled "No Assholes Allowed."